Lucas #3300 is an energy efficient coating intended for application to interior walls and the underside of roof sheathing in attics. 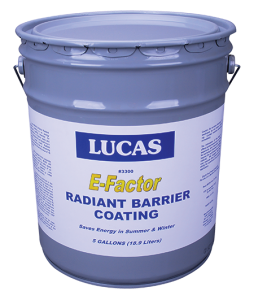 Lucas E-Factor Radiant Barrier Coating has an extremely low infrared emissivity value. 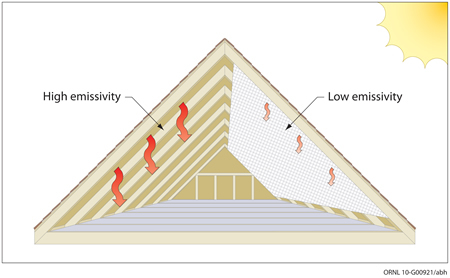 Emissivity is the percentage of absorbed heat energy that can be re-emitted as infrared radiation. Low emissivity surfaces will emit as little as 20% of the heat of most common building materials. That means that as much as 80% of the heat is prevented from entering the building and is re-emitted outside through the roof surface. This can translate to as much as 15% in energy savings. Lucas #3300 has an Emissivity as low as .16. 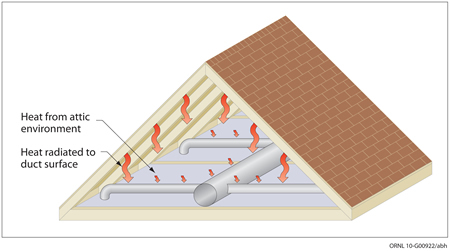 Read more about radiant barriers from the Department of Energy’s Oak Ridge National Laboratory.